Castleton University, formerly known as Castleton State College, is a public liberal arts college, located in Castleton in the U.S. state of Vermont. Castleton has an enrollment of 2000 students and offers more than 30 undergraduate programs, as well as master's degrees in education and accounting. The college is accredited by the New England Association of Schools and Colleges. Castleton University traces its history to the Rutland County Grammar School, chartered by the Vermont General Assembly on October 15, 1787. The Grammar School was a regional school, preparing young men for college through instruction in traditional academic subjects such as Latin and Greek. The institution frequently changed its name during the 19th century. At various times it was known as Castleton Academy, Castleton Academy and Female Seminary, Vermont Classical High School, and Castleton Seminary. In 1823, instruction in "the solid branches of female education" began for "young Ladies and Misses". By the time of the Civil War, the majority of the students attending Castleton were young women. In 1829, a three-story brick building costing US$30,000 was constructed on a small hill south of the village. Principal Solomon Foot (1826–1829), who would go on to be President pro tempore of the U.S. Senate during the Civil War, was the driving force in this expansion of the school. The Seminary Building (eventually known as the Old Seminary Building) was the most impressive structure in the village, but expensive to maintain and often too large for the school's struggling enrollment. Castleton Medical College (1818–1862) was also located in the village. It graduated 1400 students, more than any other medical school in New England at the time. Although Castleton Medical College and Castleton Seminary were separate institutions, they often shared faculty. Today the former medical college building, known as the Old Chapel, is the oldest building on the campus. The first female principal was Harriet Haskell (1862–1867). She had attended the Seminary as a child, took classes at Middlebury College without being permitted to matriculate, and then attended Mount Holyoke Female Seminary, which was not yet a college but offered a college-level curriculum for women. Although Haskell was in her 20s when she served as principal, the school flourished under her administration. With her departure to be principal of Monticello Ladies Seminary in Godfrey, Illinois, Castleton Seminary went into decline. 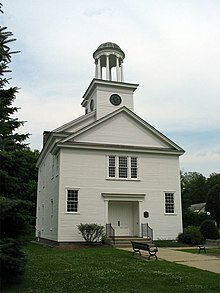 Built in 1821, Old Chapel (Castleton Medical College Building) is the oldest building on the Castleton campus. The school began its transition to a college in 1867, when the State Normal School at Castleton was founded as one of three state normal schools chartered by Vermont. Normal schools educated students for teaching careers. For 30 years the Normal School property and grounds were privately owned by Abel E. Leavenworth and his son Philip. In 1912, the State of Vermont purchased the property. In the 1920s and 1930s, under the direction of Caroline Woodruff, the College experienced dramatic growth in students and its stature. Woodruff modernized the school's curriculum, incorporating the theories of Vermont educator-philosopher John Dewey, especially his precepts of "learning by doing" and "learning by teaching". She hired staff with advanced degrees, and broadened her students' exposure to the world by bringing people such as Helen Keller, Robert Frost, and Norman Rockwell to Castleton. Woodruff was the first and only Vermonter to become president of the National Education Association. In 1947, the Normal School became Castleton Teachers College. With increased enrollment from men, intercollegiate athletics began in the 1950s. In 1962, the institution became Castleton State College when it joined other state-supported colleges in becoming a part of the Vermont State Colleges, a consortium of colleges governed by a common board of trustees, chancellor, and Council of Presidents, each college having its own president and deans. In 1979, the Board of Trustees proposed a name change to Southern Vermont State College. The proposal was never acted on. On July 23, 2015, the Vermont State Colleges Board of Trustees voted unanimously to change the name of the institution to Castleton University. Nearby Rutland plays host to the Castleton Polling Institute, as well as a professional development center for educators and entrepreneurs. In September 2016, the university opened Foley Hall, a two-floor residence, in collaboration with Green Mountain Power and Efficiency Vermont that provides housing for students. The Natural Sciences Department is located in the Jeffords Science Center, named after the late U.S. Senator Jim Jeffords. It is the largest department on campus, with 12 faculty members, all with terminal degrees in their field. Students have the option of seven different majors, in Biology, Chemistry, Ecological Studies, Environmental Science, Exercise Science, Geology and Health Science. The department is active with $538,823 in external grant funding from the National Institutes of Health-VGN and the National Science Foundation. Because of the small student/faculty ratio, students participate in independent research projects focused on salamander and snake ecology as well as microbial and plant genetics. Research is externally funded through grants supplied by the Vermont Genetics Network and the American Society for Microbiology. The chemistry program allows for specialization in either Biochemistry or Environmental Chemistry. The department offers majors and minors in history, political science, and global studies, a major in social studies, contract majors in social sciences (with primary concentrations in Geography, Economics, and Environmental Studies), minors in Geography, Economics, and Environmental Studies, and a certificate in Global Studies. In 2012, Castleton began the Castleton Polling Institute with an initial investment of $100,000. The first poll was conducted from February 11 to February 22, 2012 and polled Vermont voters about the 2012 Presidential Primaries. Since the first poll, the Polling Institute has conducted over 30 public opinion and public policy polls for state agencies, non-profits, and media organizations. The Institute's founding director, Rich Clark, is a professor of political science and had been working in academia and polling for 15 years before coming to Castleton in 2011 from the University of Georgia. The Castleton State Spartans compete in 20 NCAA Division III Varsity sports in the Little East Conference and the Eastern College Athletic Conference (ECAC). Castleton was also the 1963 NAIA Division III Men's soccer National Champions. From 1983-1986, Stan Van Gundy (later head coach of the Orlando Magic and the Detroit Pistons) coached Men's Basketball at Castleton. Castleton started a football team for the 2009 season as a member of the newly formed Eastern Collegiate Football Conference. Castleton's men's soccer team were declared 1963 NAIA co-champions (along with Earlham College of Indiana) after the championship and consolation games at Frostburg State University, Maryland were cancelled due to snow. The men's and women's Castleton Spartans hockey teams compete at the Spartan Arena in the Diamond Run Mall in Rutland. The Castleton Spartans football team represents the school in NCAA Division III college football. The team has been coached by Tony Volpone since 2014. Volpone replaced Marc Klatt, who resigned in December 2013. It has been part of the Eastern Collegiate Football Conference since its inaugural season in 2009. The 1994 film Time Chasers featured several Castleton T-shirts. According to director David Giancola, Castleton State College provided several free shirts for the film. ^ As of December 31, 2015. "2015 Performance Indicators Executive Summary" (PDF). VSC. Archived from the original (PDF) on 2016-10-10. ^ "Dr. Karen M. Scolforo". Castleton University. 2018. Retrieved Apr 11, 2018. ^ "Colors". Castleton University. Retrieved 2016-09-26. ^ a b "A Brief History of Castleton". Castleton State College. 2010. Retrieved 2017-04-25. ^ Peffer, pp. 20, 42. ^ Waite, Frederick Clayton. The First Medical College in Vermont: Castleton 1818–1862. Vermont Historical Society (1949). ^ "About the College - Castleton State College - Acalog ACMS™". catalog.castleton.edu. Retrieved 2017-09-11. ^ John Duffy; Samuel H; Ralph Orth, eds. (2003). The Vermont Encyclopedia. Burlington, Vt.: University Press of New England. p. 78. ^ "Undergraduate Catalog 2011–12" (PDF). Castleton State College. 2011. p. 5. Retrieved 2017-04-25. ^ Vermont State Colleges Manual of Policies and Procedures, Section A: Statute and By-Laws. Vermont State Colleges (2003). pgs. 4, 21. ^ Crawford, Logan (July 23, 2015). "CSC becomes Castleton University". WCAX. Burlington, Vt. Archived from the original on July 24, 2015. Retrieved 2015-07-24. ^ "Foley Hall Opens in Downtown Rutland". Castleton Magazine. Castleton University. 2016. Retrieved January 7, 2017. ^ "VGN Funded Faculty Pilot Project Grants at Baccalaureate Partner Institutions, INBRE 2014". Vermont Genetics Network. 2014. Archived from the original on 2015-04-02. Retrieved Aug 14, 2015. ^ "Award Detail: Vermont State Colleges". National Science Foundation. 2014. Retrieved Aug 14, 2015. ^ Student Research Bolstered Through VGN Grant. Castleton State College (Sep 22, 2014). Retrieved on Aug 14, 2015. ^ "Bachelor of Sciences in Chemistry". Castleton University. 2015. Retrieved Aug 14, 2015. ^ "History, Geography, Economics, and Politics Department," Castleton University 2016-17 Undergraduate Program (Retrieved May 11, 2017). ^ Heintz, Paul (March 12, 2014). "Will a New Polling Institute Put Castleton State College on the Map?". Seven Days. Burlington, Vt. Retrieved March 12, 2014. ^ "Vermont Voters & the 2012 Presidential Primaries". Castleton State College. 2012. Retrieved Feb 22, 2016. ^ Wolk, Dave (May 29, 2012). "Vermonters Say …". New England Journal of Higher Education. Retrieved Feb 24, 2016. ^ "Men's Soccer Championship Records" (PDF). National Association of Intercollegiate Athletics. Retrieved September 21, 2014. ^ "About the Diamond Run Mall". Diamond Run Mall. 2015. Retrieved Feb 23, 2016. ^ "Volpone hired as football coach at Castleton". Burlington Free Press. Burlington, Vt. March 10, 2014. Retrieved March 10, 2014. ^ "Castleton Hoping for Continued Success in Year Three". Eastern Collegiate Football Conference. 2011. Retrieved 2012-02-06. ^ Secretary of the Vermont Senate (2017). "Biography, Kevin J. Mullin". Vermont State Senators, 2017-2018. Montpelier, VT: Vermont General Assembly. ^ "Time Chasers (Trivia)". IMDb. Retrieved Aug 14, 2015. Peffer, Tony, ed. (2012). Big Heart: The Journey to Castleton's Two Hundred and Twenty-Fifth Birthday. Castleton, Vt.: Castleton State College.